At Simon Thomas Pirie Ltd we pride ourselves in being able to turn our hand to any furniture-related job be it big or small. This year we have been fortunate to have been approached by three separate local churches to help them with very different projects. Working within the architecture of these beautiful sacred spaces always gives us lots of scope for dramatic designs that domestic furniture rarely enjoys. There are also millennia of history, faith, tradition and religious practice to draw on and sometimes move away from. Fertile creative ground! 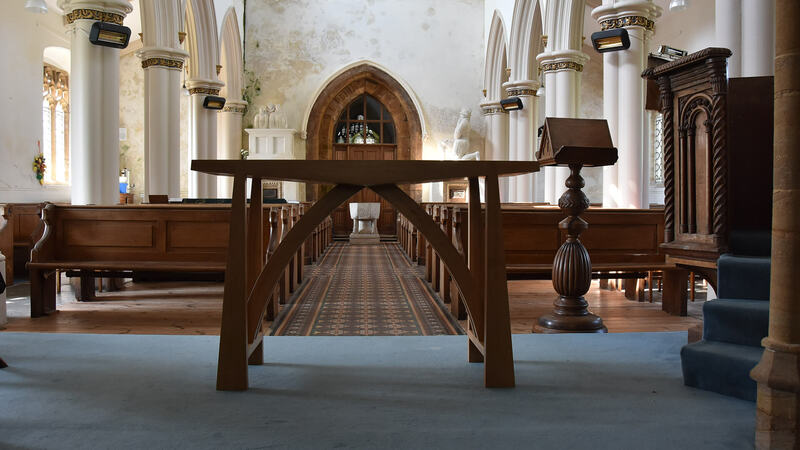 The first of these projects, a new nave altar, was for St Mary’s Church in Morden. 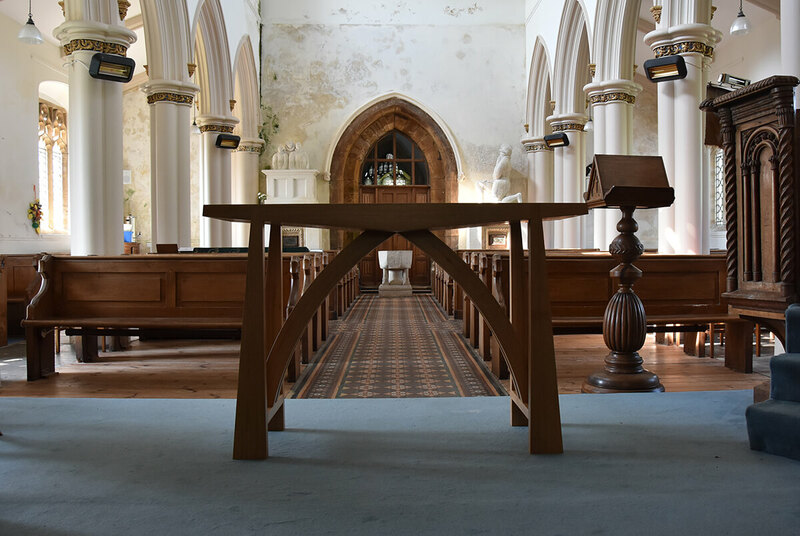 On visiting this unusually light and airy Parish church, Simon was immediately struck by the beautiful way in which the nave arch and the West window followed the exact same curve and so it made perfect sense to replicate this feature in the under-frame of the altar table. 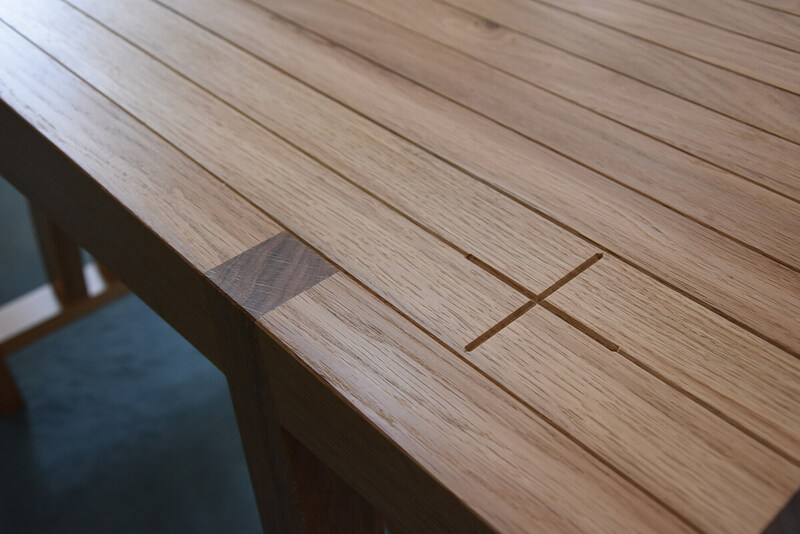 The whole thing is made from solid oak with the top constructed from 11 separate shaped pieces, this is emphasised by a small v-groove running along the length of the top creating a visibly grooved surface. 5 simple crosses are inscribed slightly deeper into the top of the altar joining the v-grooves. It’s a simple but striking detail. Now taking its place under the nave arch, the altar complements the simple beauty of the church interior. 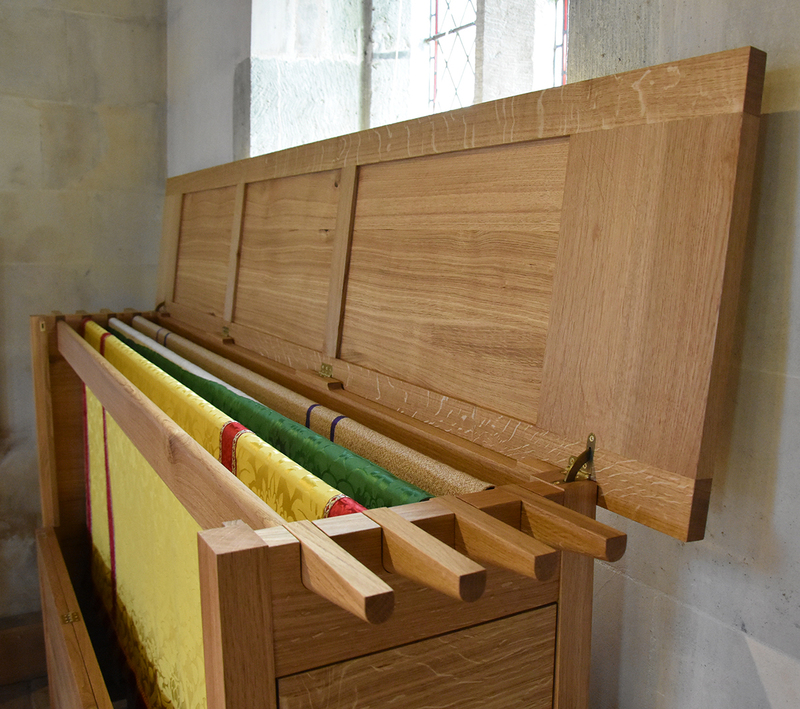 The next piece is a frontal chest, used for the storing the altar cloths in St Andrew’s Church in Fontmell Magna. It was commissioned by a couple for whom this church is very important; the piece is both a gift to the church and a lasting memorial to a grown-up son who sadly passed away recently. Again made entirely out of solid oak this large cabinet is solely for hanging and airing altar cloths that only get used at very specific times of the religious calendar. While being a simple piece to look at, ensuring airflow through the textiles and that they can be easily lifted out made this a challenging piece to design. It’s sheer size, governed by the cloths it has to store, also made getting the correct proportions challenging. 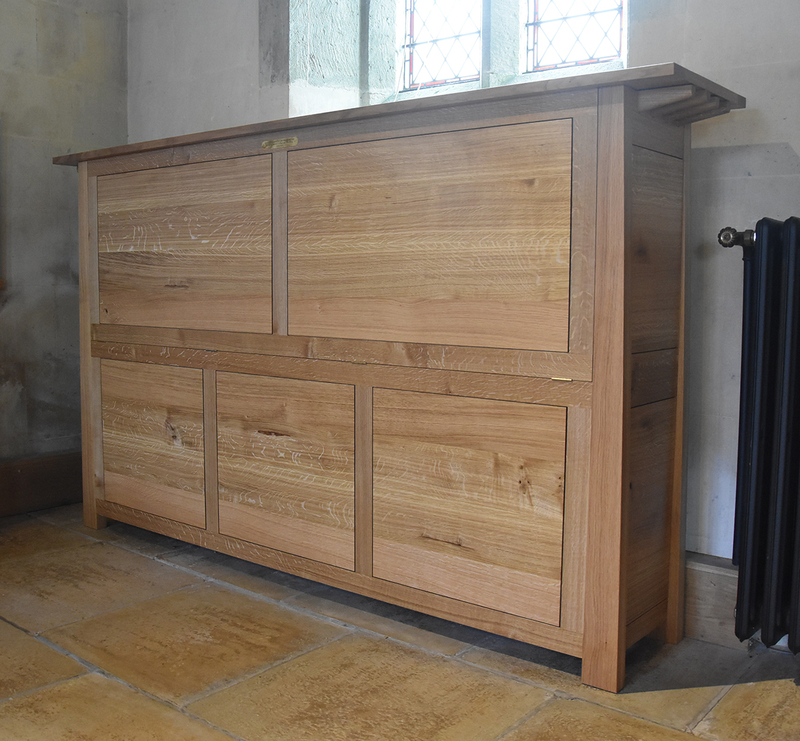 The end result is a classic piece of English ecclesiastical furniture with a subtle hint of the contemporary with those crisp, shadow-line detailed, oak panels. The other feature that stands out are the 4 the hanging rails that break out from the frame to form the sloped lifting handles under the overhanging top. With half of the front panel and top hinging open this makes changeovers simple. 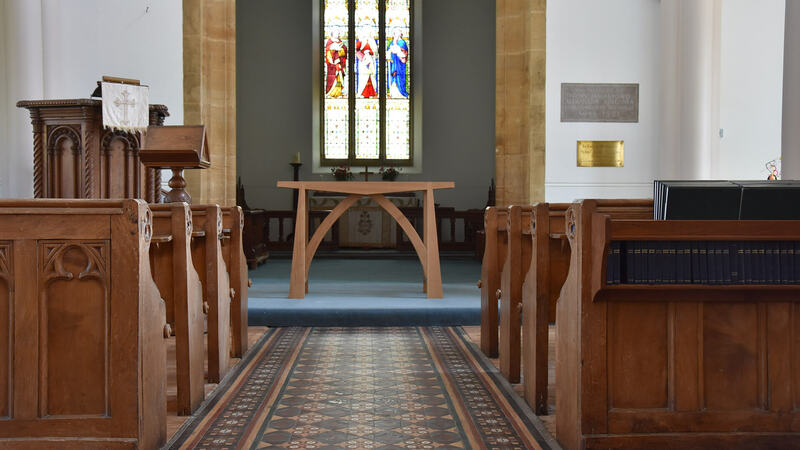 Finally, a commission from a church we already know well: St Laruence’s at Affpuddle is the closest church to our workshops, several years ago we also made a striking sycamore & oak memorial table for the side aisle. 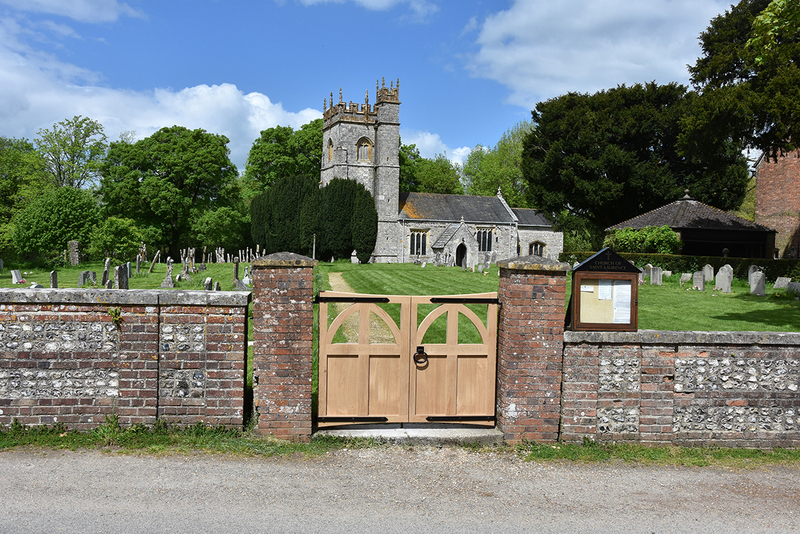 This time we were asked to make new gates into the churchyard. Although we were initially approached by the PCC they did have a benefactor who lived overseas but had grown-up in the parish and wanted to commission the gates as a gift to the church and as a family memorial. The new gates are a refined version of the existing gates which had been hanging for around 50 years but had become tired and started to rot. We added some subtle curved top and bottom rails and simplified the centre cross to be able to take some script for the family memorial text. We commissioned Zoe Cull of Stoneform to come up with some beautiful curved bespoke script work on the centre cruciform rails. The client asked for some locally sourced Dorset oak. We found a very nice, air-dried log through Will Miller who often sources and saws rare, local logs for us.